In my part of the world, summer settles softly to an end. There always comes a week that whispers the season's slow goodbye. The long stretch of woods behind my house becomes quieter. The grass under my bare feet starts to feel chilly at night. The air carries that scent that I can only call the smell of September. 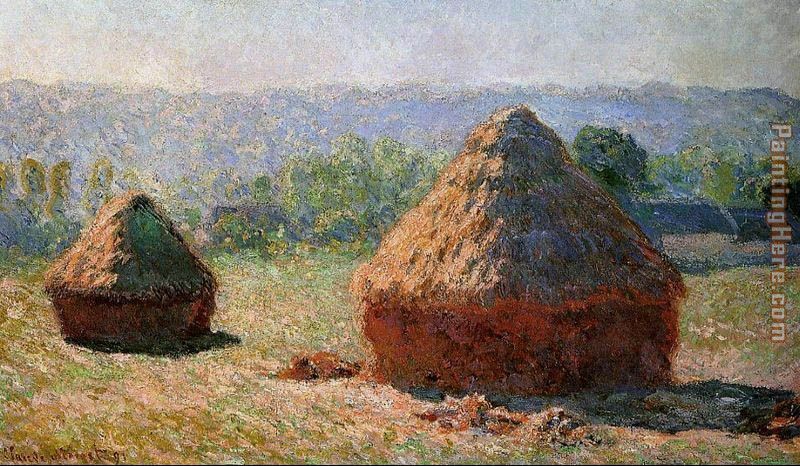 Monet's "Grainstacks at the End of Summer"
I believe in the wonder of all of these things I place before my sons, but I still feel heavy in the heart when summer ends. Life used to be marked clearly into sections when I was a kid. When the last day of school came, it felt like I needed to break into a run and keep going until the ocean waves flared into white plumes around me. It felt like I stood at the ticket gate of a vast carnival filled with infinite rides. Now, summer comes, but it feels more like it flows around me, as if I were a stone in a stream, until the river finally goes dry. I'm not like a lot of parents who pray for September so that the kids will be back in school and out of their hair. I love my boys' summer freedom. I love to watch them sit in pajamas on rainy days and even on the occasional sunny one. I love to hear them running on the front lawn with their friends as twilight comes, shouting strategies and mimicking gunshots. Their summer play makes me feel free, too, even though I have to work in my school through the season. Each year, I say goodbye to summer with a sigh. I watch my school's students sigh as they cross the threshold into another long year. Each year, summer sighs its goodbye with cool, sweet breath and I sit on the deck behind our house and look up at the stars framed by the circle of leaves. I hear people in my neighborhood talking in nighttime voices, probably about their spent vacation, as if they are afraid to wake summer up as it settles to sleep, tucked in by the new autumn. My heart smiles sadly at summer's end. That's what it does. I hated it too, even though I loved to learn -- maybe because I love to learn.) Possibly another post soon? It is funny that this comes up now. I was thinking about this last night. My friends begin their classes today, and mine begin next wednesday. We've gotten together plenty of times throughout the summer, but last night felt a little different. We kinda changed our routine. We sat outside, enjoying the coolness in the air and talking. Then we decided it was time to watch a movie or two. We sat down and watched Ferris Bueller's Day Off. Now I have seen this movie at least a hundred times. But this was different. We watched it, and enjoyed it. Sure we laughed and quoted the occasional line, I dropped some fun facts that I know they'd heard before, but there was something more. We experienced the movie, and just enjoyed being with each other. It was like a last embrace before we ended up pursuing own endeavors. Until this summer, I don't believe I ever really experienced a summer. For much of this one, I was taking summer classes, working a monotonous job, or prepping for the next year of school. But last night was special, and for no real specific reason. I didn't get a first kiss, we didn't almost get arrested, we didn't even stay up late into the evening. We watched TV, and, for me at least, felt more connected to my friends than I have in a while. It was simply being in the moment. We toasted each other, and John Hughes, with nonalcoholic sparkling peach juice. I'm sure my friends thought I was being ridiculous, but I felt something should be done to mark the occasion. We were still friends, and even though summer was over, last night was worth a whole summer in itself. Well said, my friend. Well said. A cool tradition you and you friends have, that movie night . . .
Is it any comfort to know that it's only leaving you to come to us? It's nice to know summer will be in good hands, for sure. Came over to visit from Quid plura?, who linked to this post. You captured the feeling well ... this end-of-summer sighing. Achingly so. Wishing you well on your new school year. Thanks for stopping by, Elsa. And thanks for the kind words. The end of summer does have such an emotional charge to it . . .
What a nostalgic post! I just can say it: Don't wake me up when September comes, please... At least in your part of the world. Elena -- thanks so much for the kind words. Sleep on, I say!